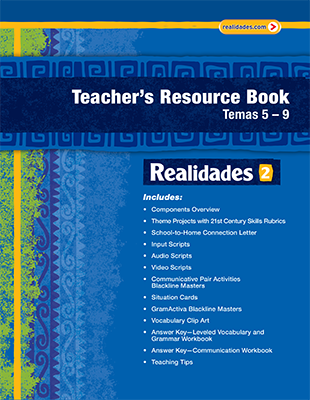 Realidades 2 Digital Edition ©2014 provides standards-based instruction that seamlessly integrates vocabulary, grammar, communication, culture, and digital learning. This balanced approach is built upon the principles of backward design with assessment aligned with instruction. The program features many resources for differentiated instruction, including updated Pre-AP® components, that are available in print, on DVD-ROM, or online. 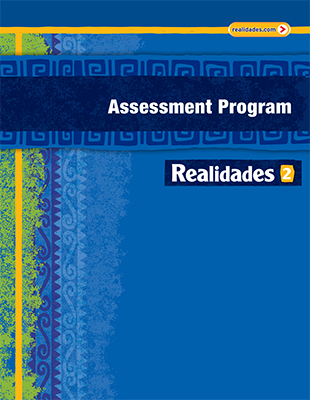 The Digital Courseware, realidades.com, offers the newest and most powerful online learning system available in any middle school and high school Spanish program. 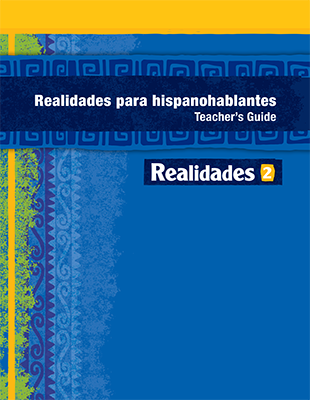 Realidades 2 contains an introductory section called Para empezar and 9 Temas divided into A and B chapters. Realidades 2 is used effectively as the second year program in an articulated sequence of instruction. Choose the Student Edition format the works for you! This two-in-one workbook conveniently provides differentiated practice to help students learn the new vocabulary and grammar. 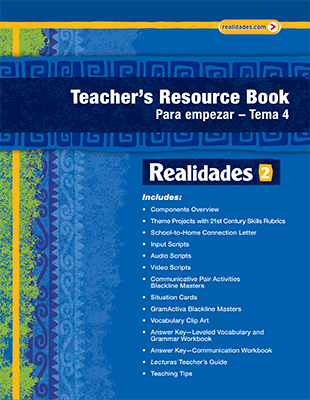 Choose the print workbook and/or the workbooks on realidades.com. 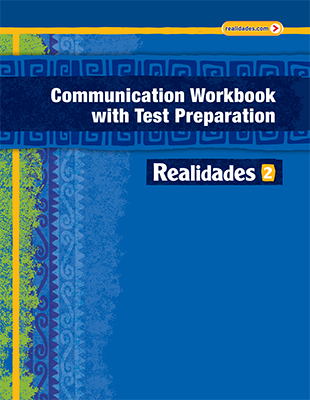 This all-Spanish companion worktext provides complete support for teaching the heritage learner with Realidades. Expanded language development activities support each chapter section. Separate Teacher’s Guide available. Inviting readers include 16 selections each—poems, stories, fables, and authentic literature, at Level 3. Answers in Volume A or 1 of Teacher Resource Books. A separate Answer Key is also available. The 4-color laminated and 3-hole punched Grammar Study Guides provide complete support for grammar founds in Spanish 1 and 2. Sold in packets of 35. Features informational and authentic readings with supporting vocabulary, comprehension, and application activities. Volume 1 readings support the Novice Low to Intermediate Mid Interpretive Reading Benchmarks (Realidades A/B, 1, 2). Volume 2 readings support the Intermediate Mid to Advanced Mid Interpretive Reading Benchmarks (Realidades 3, 4). These updated resource books provide a detailed overview of the program components and ways to integrate both print and digital resources with daily instruction. The resources are conveniently organized by chapter and many are blackline masters (BLMs). Available in print, on DVD-ROM, and on realidades.com. 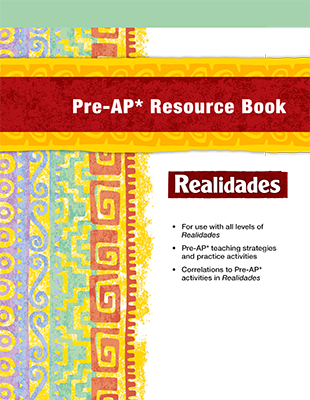 This highly recommended resource book has been updated for the AP® Spanish Language and Culture Examination and to include Realidades 4. The book features thematic planning charts, teaching tips, a focus on pre-AP activities per chapter, and additional practice. Available in print, on DVD-ROM, and on realidades.com. Complete support for integrating TPR Storytelling with Realidades. Written by Karen Rowan. Designed for students in regular or advanced/gifted levels of instruction, the Assessment Program includes Placement Tests, Chapter Quizzes, Chapter Tests, Cumulative Tests, and Rubrics. This Assessment Program offers alternate, adapted versions of the regular testing program for students with special needs. Available in print, on DVD-ROM, and on realidades.com. Proficiency test that provides feedback to enable appropriate placement. 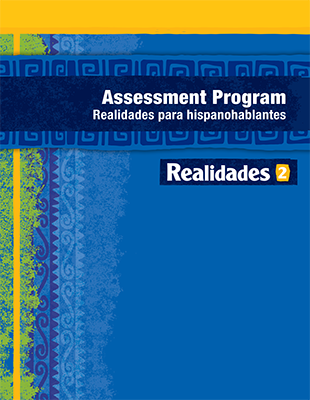 This Assessment Program provides all-Spanish assessment and rubrics for students using Realidades para hispanohablantes. A Placement Package for Spanish Speakers is available separately. Available in print, on DVD-ROM, and on realidades.com. This all-in-one DVD will make planning easier and save you time. The interactive Teacher’s Edition eText includes the digital version of the Teacher’s Edition with all the side “wrap” notes linked at point-ofuse to all program resources you need! You can also access individual resources through the Resource Library. 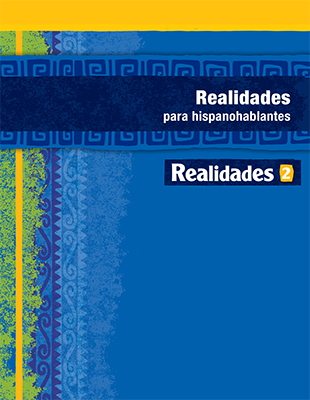 Also available on realidades.com as online eText. Engage all the learners in your class with the fun and effective activities and tools on this DVD-ROM! 200+ activities with directions and extension ideas per level: click-and-drag, fill-in-blank, sequencing, storytelling (with audio), polls/Surveys (with audio), and games. Written in SMART Notebook Express software, these activities work on a variety of interactive whiteboards. Also on realidades.com. This convenient presentation tool is a time saving tool for teaching the new vocabulary and grammar. Teachers can access vocabulary and grammar presentations modeled after the Student Edition, audio files, GramActiva videos, and clip art plus country maps and photos. All program transparencies are included: Vocabulary, Grammar Maps, Graphic Organizers, Bell Ringers, Answers, and Fine Art Transparencies. Teachers can quickly access the four test banks available for each chapter or create their own tests. The ExamView test banks are also available at realidades.com. All audio mp3 files are conveniently placed on one DVD-ROM. Each level DVD-ROM, contains all the audio that accompanies the program from the Student Edition, Communication Workbook with Test Practice, and Assessment Program tests. The Videocultura DVD feature 18 engaging cultural videos that introduce students to the cultural theme in each Tema in Realidades A/B/1 and 2. Each video segment is approximately 2 minutes in length and available in two versions. The first version contains an English narration and the second, a Spanish narration. The single package contains the culture videos for Levels A/B/1 and 2. If you have ever gotten tired of modeling paired practices for your students, then this video is for you! The Videomodelo segments feature teens from different Spanish-speaking countries modeling interpersonal speaking tasks from the Student Edition. What a great way to build pronunciation skills! Students can see the Videomodelo clips within the eText and the assignable activity on realidades.com. Available on DVD and on realidades.com.